Beloved storybook character, Alice, curious as her two cats Kitty and Snowdrop, wondered what life would be like on the other side of a looking glass. She was able to access that alternate universe. I tried the same thing as a kid, but with no luck. I pushed as hard as I could with my hands firm up against the mirror over the dresser in my bedroom, and only came up against resistance. “How did she do that?” I would say to my reflection and figured it would be much easier to fall down a rabbit hole; only our yard didn’t have one. Lexington, with the same curiosity, has been trying for days to go through the mirror in my ballet studio. “Lex, it was only a children’s story; the product of Lewis Carroll’s imagination.” Still, he ponders the possibilities as he sees peculiar goings on over there on the other side. I can only imagine what he would find; hopefully something more intriguing than a chess game come-to-life and nursery rhyme characters. Although, it would be fascinating if the Cheshire Cat made an appearance. Maybe in Lexington’s looking glass universe he would meet a flying pony, or maybe a Chihuahua in a pirate ship! It’s a good thing Captain Hook is in a different fairytale. Hey, is that our resident squirrel coming out of the looking glass, now how did he do that?! Lexington, you better go talk to the squirrel. 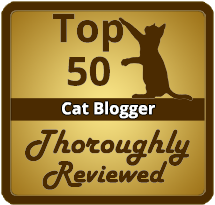 This entry was posted in Cat Behavior, Cat Lady, Children's Books and tagged Alice Through the Looking Glass, cats, Cheshire Cat, Lewis Carroll, Lexington. Bookmark the permalink. If it were possible, I know my Chris, the explorer, would be the first one through. Looks like Topper was contemplating a new world beyond the mirror as well. No photoshopping here… it’s that magical looking glass! 😉 That’s Bobcat looking into the mirror with Lexington and Topper, well, he managed to get through the looking glass. These are getting better and better Pamela. Keep it going! !